The $1 Zimbabwe dollar note. The Zimbabwe situation is this, there is not going to be a reintroduction of the Zimbabwe Dollar anytime soon, contrary to what the gurus are saying. There are no plans to even begin designing a new currency, I know this because the new MRI Bankers’ guide to foreign currency does not include the Zim dollar, so at the present time (2015) this currency is dead. Invest in gold and silver because that is what the people of Zimbabwe are using to buy and sell. Yes, it’s true they use international currencies, however, when you watch the documentary below (scroll down to the bottom) you will understand what is happening. I want everyone to know that here at GlobalCurrencyReset.net, I, Nick Giammarino, am not here to just make up lies like the dinar gurus do and tell you next week, next month, even next year. I don’t entertain, I inform. Right now, the situation in Zimbabwe has deteriorated to the point that it is very dangerous to stay there for any length of time. Unemployment is high, the use of multiple currencies over a national currency is evident, and people want regime change. Please watch all of the videos I posted below, the one towards the bottom was filmed there and shows why they prefer gold to currency. For anyone still ignorant, and thinks that Zimbabwe will “reset” the Zim dollar, which is no longer being used as I’ve stated for months, that article is for you. The video below explains a lot. Scroll past it to read more about the Zimbabwe situation and this new report. 11. The authorities have reiterated their commitment to the multi currency system, which is dominated by the U.S. Dollar in practice, and have recently added four new currencies as legal tender. They stressed that the regime will remain in place over the medium term (until at least 2018) to ensure macroeconomic stability. The authorities agreed that the full restoration of fiscal, financial, and external sustainability is a pre-requisite before any substantive changes to the exchange rate regime are considered. 12. The record of implementing recommendations from the previous Article IV consultation is mixed. In concluding the 2012 consultation, Executive Directors urged strengthening fiscal management, improving the expenditure mix, increasing diamond sector transparency, containing financial sector vulnerabilities, and resuming payments to external creditors. The authorities’ 2013 budget was based on prudent revenue projections, including diamond dividends. However, revenue under-performed as growth decelerated at year’s end. Old domestic arrears were aggressively resolved in 2013, even as higher-than-budgeted expenditures contributed to the accumulation of new arrears. The wage bill continues to claim a disproportionate share of total spending, crowding out capital and social expenditures. Progress on structural reforms, including measures to increase diamond sector transparency, has been slow. The Reserve Bank of Zimbabwe (RBZ) has intensified monitoring of troubled banks, but vulnerabilities persist. Since 2013, Zimbabwe has been making regular payments to the Poverty Reduction and Growth Trust (PRGT) and to other IFIs. 18. The new government is reviewing the amendments to the Banking Act, for which a draft was at an advanced state. The principles for the amendments will be submitted to Cabinet in June 2014 and to Parliament in July 2014. Zimbabwe’s 12-month inflation rate decelerated from 2.9 percent at end-2012 to -0.3 percent in April 2014. The deceleration is partly driven by weak aggregate demand. A closer inspection of CPI components indicates that deflationary pressures have been stronger in traded sectors (Box Figure 1), suggesting that pass-through from a depreciating rand also plays an important role. 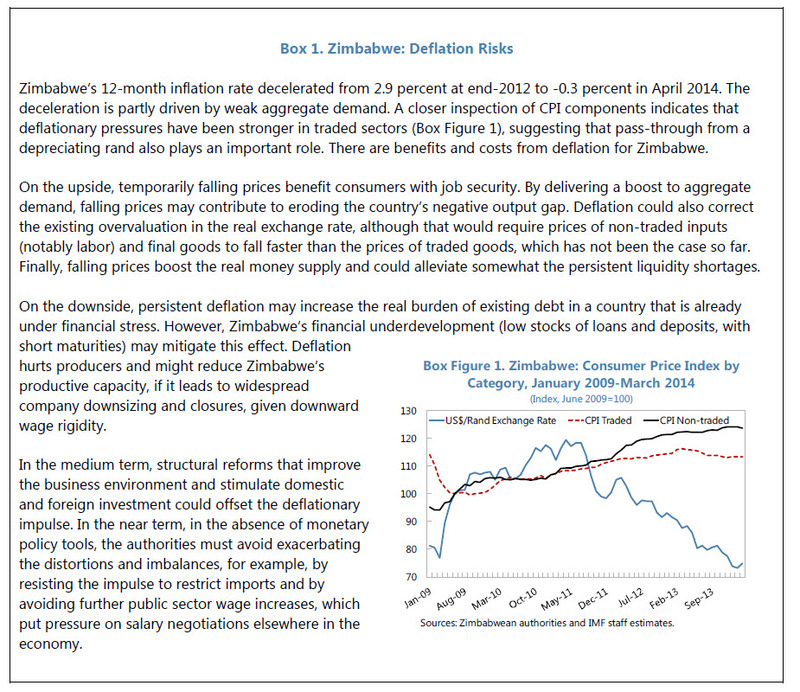 There are benefits and costs from deflation for Zimbabwe. On the upside, temporarily falling prices benefit consumers with job security. By delivering a boost to aggregate demand, falling prices may contribute to eroding the country’s negative output gap. Deflation could also correct the existing overvaluation in the real exchange rate, although that would require prices of non-traded inputs (notably labor) and final goods to fall faster than the prices of traded goods, which has not been the case so far. Finally, falling prices boost the real money supply and could alleviate somewhat the persistent liquidity shortages. On the downside, persistent deflation may increase the real burden of existing debt in a country that is already under financial stress. However, Zimbabwe’s financial underdevelopment (low stocks of loans and deposits, with short maturities) may mitigate this effect. 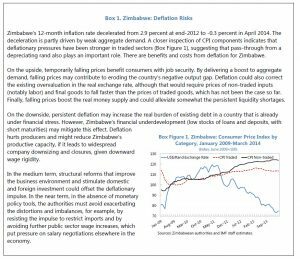 Deflation hurts producers and might reduce Zimbabwe’s productive capacity, if it leads to widespread company downsizing and closures. 32. 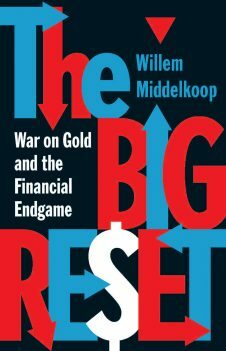 To address deteriorating asset quality and restore confidence, serious consideration should be given to closing troubled banks (if non-systemic), or at least ring-fencing them, for example, by restricting their ability to take new deposits from the public. With the help of outside consultants, the RBZ is developing a framework for NPL resolution. Any strategy to deal with this issue should avoid rewarding poor past lending decisions and should be accompanied by a strong focus on the risk that current economic conditions and poor lending practices could result in further growth in NPLs. In January 2014, the RBZ announced an immediate end to new insider and related-party loans: banks’ boards are required to review the levels of insider loans, ensure adequate provisioning, and report regularly to the RBZ.9 The RBZ’s decision to allow more time to meet the increase in the minimum capital requirements is justified, as the June 2014 deadline for reaching a minimum capital of US$100 million was looming with most banks being far below that level. In the period ahead, the RBZ will need to closely monitor observance of the interim milestones for progress towards the December 2020 minimum capital requirements. The AFTRADES inter bank liquidity facility is a worthwhile policy experiment and offers potential for improving the operations of the interbank market without significant fiscal risks. 46. The new government has formulated an ambitious agenda for development (ZIM ASSET). The plan is built around four main clusters: food security and nutrition, social services and poverty eradication, infrastructure and utilities, and value addition and beatification. ZIM ASSET targets a medium-term growth rate of around 6 percent, driven by large infrastructure investments. However, large levels of financing would be needed to implement ZIM ASSET. Implementation is also likely to run into domestic capacity constraints. The authorities’ financing plan is premised on joint ventures, diaspora resources, external financing, and, most importantly, an abundance of domestic mineral resources, some of which would be channeled via a Sovereign Wealth Fund (SWF). However, access to external financing is very limited and recourse to new non-concessional external debt to fund these projects would exacerbate debt distress and complicate the process of clearance and debt restructuring. In addition, while the beatification objectives of ZIM ASSET contain positive elements, Since 2009, Zimbabwe has adopted a multi-currency regime, including the U.S. dollar, the South African rand, the British pound, the euro and the Botswana Pula—with the U.S. dollar as principal currency. 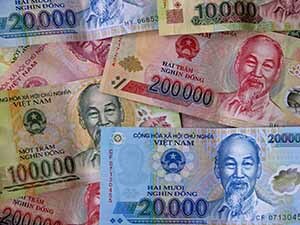 The Australian dollar, the Chinese yuan, the Indian rupee and the Japanese yen were added to the list in February 2014. The use of the Zimbabwean dollar as domestic currency has been discontinued. The de facto exchange regime is classified as exchange arrangement with no separate legal tender. Zimbabwe is on the standard 12-month consultation cycle. The Executive Board discussed the staff report for the 2012 Article IV consultation on September 21, 2012. 11. Zimbabwe remains in debt distress in the baseline scenario of no debt relief. In the baseline scenario, which includes new non-concessional borrowing of 2 percent of GDP a year on average from 2017 on-wards, Zimbabwe’s debt indicators remain above the relevant indicative thresholds. Zimbabwe’s debt situation is vulnerable to shocks, particularly to exports and GDP growth. Zimbabwe’s debt outlook also appears sensitive to FDI flows and to less favorable financial terms. 12. The Zimbabwean authorities share the staff assessment and therefore remain committed to re-engaging with all creditors, multilateral and bilateral. Staff encourages the authorities to continue to primarily seek grants and financing on terms as favorable as possible, ideally at highly concessional terms, to finance critical development projects with high economic returns. Limited non-concessional borrowing could be considered only if grants and concessional resources are unavailable or insufficient to implement critical growth-enhancing projects. The economic rebound experienced since the end of hyperinflation in 2009 has now ended. After averaging 10 percent over 2009-2012, growth fell to an estimated 3.3 percent in 2013, reflecting tight liquidity conditions, election-year uncertainty, weak demand for key exports, competitiveness pressures, and the impact of adverse weather conditions. Inflation continued its downward trend from 2.9 percent (year-on-year) at end-2012 to -0.3 percent in April 2014, mainly reflecting the appreciation of the US dollar against the South African rand and weak domestic demand. improve the sector’s performance and stability. Furthermore, the Zimbabwean authorities have initiated steps to restore the role of the RBZ in the economy, which should enhance financial inter mediation. These include the Government’s decision to recapitalize RBZ, transfer the treasury account from the Commercial Bank of Zimbabwe, and thereby incapacitate RBZ to play its functions as lender of last resort and banker to the government. With a robust lender of last resort facility, RBZ will be in a position to participate more significantly in the development of the inter-bank market and accommodate solvent institutions that experience temporary liquidity shortages. These measures are expected to stimulate economic activity, in line with the objectives outlined in ZIM ASSET. In March 2014, a US$100 million inter-bank facility by Afreximbank was launched to address the liquidity crunch in the system, in accordance with the authorities’ announcement during the 2014 National Budget statement. Through this facility, illiquid but solvent financial institutions will be able to access temporary funding. The authorities hope that this will help restore confidence in the market and encourage inter-bank activity. On measures intended to further anchor the multi-currency system, the RBZ in January 2014 added the Australian dollar, Chinese yuan, Indian rupee and Japanese yen to the list of currencies accepted as legal tender alongside the US dollar, South African rand, Botswana pula and British pound. This was prompted by an increase in trade and investment between Zimbabwe and Asia, and is expected to reduce transaction costs and boost trade between Zimbabwe and its partners. Thanks for reading about the currency Zimbabwe situation and about the Zimbabwe Dollar, I hope this was informative.